This is not an inspirational, positive-thinking, motivational message. These are not daily affirmations. Rather, the point here is to draw attention to the multifarious obstacles in your life, recognize that they are there by choice, affinity, and design, and further, that they constitute your life, even while they congest it. In the face of so many self-improvement programs, the aim here is to realize that there is nothing to improve and the only obstacle to remove is your objection to obstructions. 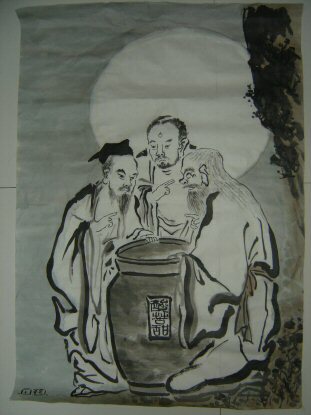 *The image above is a classic Chinese depiction of Confucius, Buddha, and Lao-tzu (L-R). They are each tasting from a vat of vinegar. Confucius and Buddha both have pursed lips due to the unpleasant taste. Only Lao-tzu has a hint of a smile, taking delight in the bitter. The vinegar is a metaphor for life.